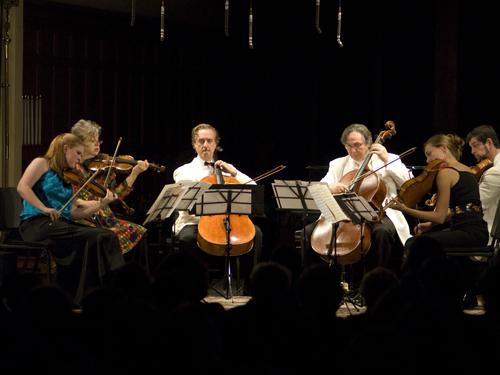 In front of a capacity audience at the Menlo-Atherton Performing Arts Center, Dvořák’s “American” quintet concluded Music@Menlo’s eighth season, Maps and Legends. This year, perspectives of place and time and the phenomenon of cultural influence re-imagined the festival’s 2004 theme, Cultural Odyssey, combining diverse works of shared inspiration, and connecting locations, eras and peoples through music. Please visit the festival web site for numerous accounts of this year’s festival as well as numerous videos and archived live-streamed events. Long before we founded Music@Menlo, Wu Han and I dreamed of creating an ideal environment for music, one in which listeners would be engaged for a span of time, hearing great performances and immersing themselves in the fascinating contexts from which immortal works of music emerged. We had spent many years observing other festivals from the perspective of performers, keeping track of each one’s strengths and weaknesses, and eventually put our ideas to the test as Artistic Directors of La Jolla’s SummerFest for three seasons. That experience, to make a long story short, confirmed our suspicion long held: that if we expected to realize our dream, and fulfill our ideals at the highest level, we would have to begin with a concept purely our own, and build the structure to support it from the ground up. That was how Music@Menlo started, and how it continues to this day. 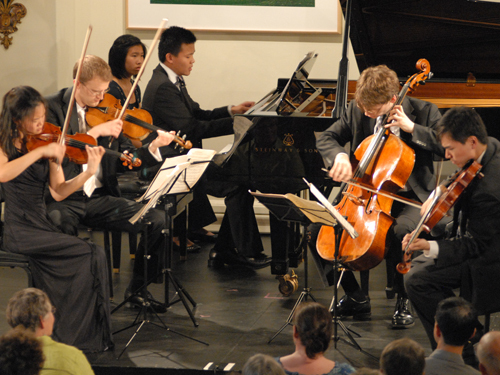 Music@Menlo is founded on our unshakeable belief that great music is one of the world’s most valuable resources. In addition to the sensual pleasure and spiritual renewal music offers at the most basic listening level, deeper engagement with the art form opens doors to realms of enlightenment: connections with cultures across ages and continents; fluency in new and diverse musical languages; enhanced understanding of Western history dating back to the Middle Ages; intensified enjoyment of well-known works, and an increased appetite for and capacity to be engaged by unfamiliar music of any style or period. 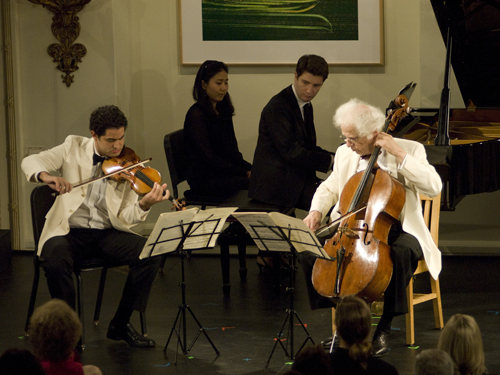 During the planning of Music@Menlo’s first season, our goal of deeply engaging a potential Silicon Valley audience was questioned by some who believed that our listeners would want only to be entertained and seek relaxation through classical music. We are happy to say that despite our advisors’ best intentions to help the project, they were wrong. When presented, in our first brochure, with the possibility of not only hearing great concerts but being engaged and enlightened as well, listeners showed up in droves, and Music@Menlo finished its inaugural season having hit 98% capacity, a goal predicted to take five years. During the succeeding seasons, we have never wavered from our commitment to provide what has been repeatedly asked of us: deep learning experiences every summer, consistently high quality performances, stimulating programming, new and familiar performers, and both new and familiar music. It may seem simple to say, but it’s all about starting off on the right foot. As mentioned in this post’s introduction, Maps and Legends evolved from the festival’s second season concept of visiting a variety of important locations, immersing ourselves in their music and cultures. Widening that concept this season to include the dimension of time, and the phenomenon of musical cross-pollination, we constructed a festival that was literally all over the map, sometimes crossing borders repeatedly during a single concert, and jumping centuries in a single bound. Holding all this potentially-chaotic programming together were our rigorous and carefully-constructed contextual offerings, which included master classes, Café Conversations, AudioNotes and the Encounters series, all designed to provide the “Legend” by which the “Map” could be easily navigated. We are proud to reveal that credit for this summer’s festival title goes to Artistic Administrator Patrick Castillo. 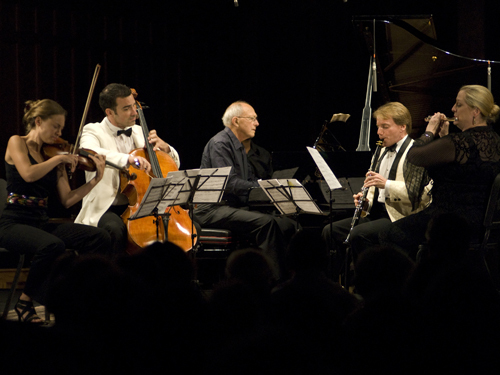 The festival opened with one of the most singular and adventurous programs it has ever presented. Bringing together works inspired by specific times of year, we opened with a complete performance, all before intermission, of Vivaldi’s The Four Seasons, and closed the concert with George Crumb’s Music for a Summer Evening. A novelty for the Vivaldi was the participation of four soloists: Erin Keefe, Ani Kavafian, Philip Setzer and Ian Swensen, each applying their distinctive sounds to Vivald’s ultra-familiar concertos. Looming behind the small baroque ensemble was the impending battery of percussion instruments, which created a kind of seeing-into-the-future atmosphere. But what amazed me, while listening to Wu Han, Gilbert Kalish, Ayano Kataoka and Chris Froh mesmerizing the audience with Crumb’s magical sounds, was how equally innovative and daring the Vivaldi must have seemed in the 18th century. Even with all the experience we have as programmers, there are still revelations that only manifest themselves when the concert actually happens. What a joy and challenge that provides us! R. Larry Todd, returning after his brilliant Mendelssohn Encounter last year, led us through the Renaissance of English music in the first half of the 20th century that gave birth to the music of our second program: Walton’s Piano Quartet, Britten’s A Charm of Lullabies, and Elgar’s Piano Quintet. A concert of rarely-heard music by very familiar composers turned out to be the season’s sleeper concert: so many who were unsure of what they were coming to were totally taken with the pieces, cheering the thorny Walton Quartet as if it were a barn-burner by Tchaikovsky. Committed and passionate playing by Lily Francis, Ani Kavafian, Inon Barnatan and the Miro Quartet provided a concert that resonated for the duration of the festival. 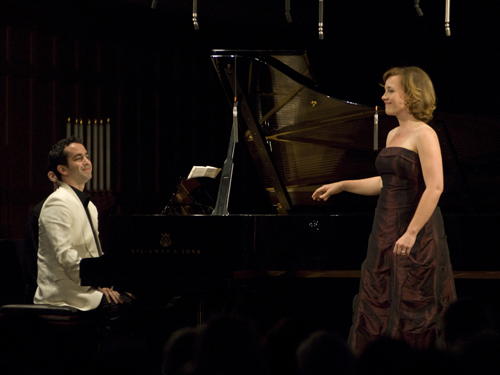 And the spectacular mezzo-soprano Sasha Cooke, making her festival debut and partnered by returning pianist Inon Barnatan, stole the audience’s hearts in the first of her many appearances this summer, in Britten’s haunting song cycle. The first weekend also included the first of many Prelude Performances by our International Performers, the senior component of Music@Menlo’s Chamber Music Institute. Joining the Amphion Quartet on stage is pianist David Fung. 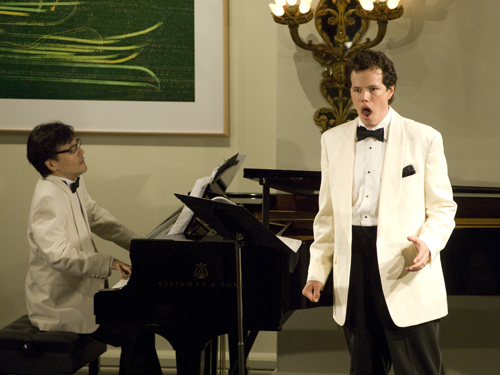 Sunday brought an intense Carte Blanche performance of Schubert’s Die Winterreise, with baritone Randall Scarlata making his Music@Menlo debut. 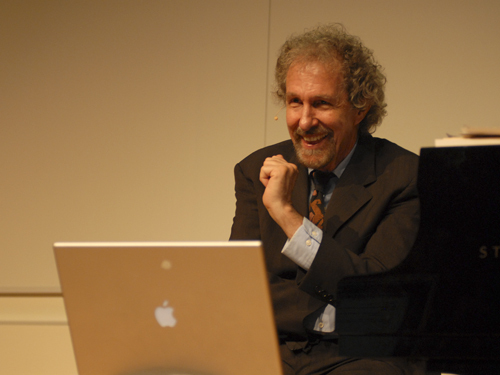 Pianist Gilbert Kalish accompanied him on this journey (which connected beautifully with the festival theme), contributing his own legendary artistry as vocal collaborator. 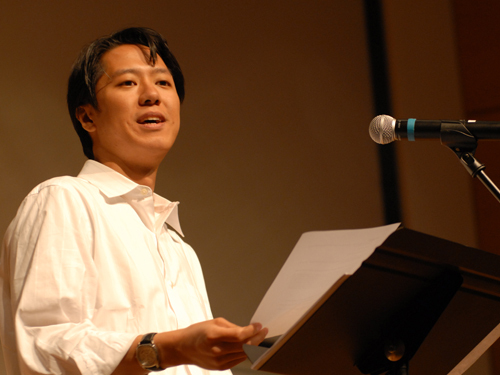 Patrick Castillo, emerging this season as a more frequent presence on stage, led a pre-concert reading of poetry related to the immortal song cycle. The cancellation by long-time festival artist Jeffrey Kahane (due to a virus from which he has since recovered) necessitated our finding a suitable program to replace his Carte Blanche recital. It was Music@Menlo’s great luck that the extraordinary young Finnish pianist Juho Pohjonen agreed, on short notice, to make the trip all the way from Helsinki to play a single recital for us. What a stunning performance it was! 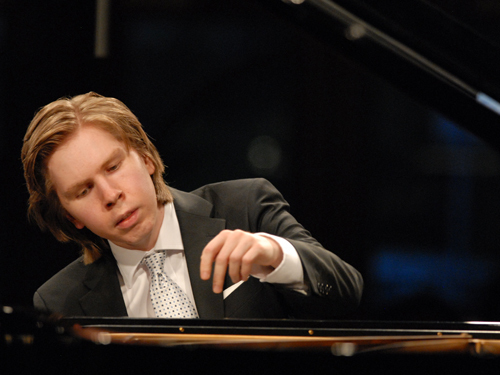 Juho constructed an ingenious program based on the variation form, and played it with a command that made you feel he had composed the pieces himself. We are all tremendously indebted to him and look forward to his return as soon as possible. Encounter leader Ara Guzelimian visited the festival to guide our audience through two concert programs: Vienna and Aftermath: 1945. Ara connected the rise of Vienna in the 18th century (becoming the musical capital of world) with its cultural demise in the 20th, culminating in World War II. In one of the most powerfully moving Encounters we have heard, the music of Webern and Strauss were heard as resonances of Beethoven and Schubert, and the impact of the war on composers was graphically illustrated as we looked at photos of the destruction of the Munich Opera House. Adding to the evening’s emotional charge was the presence in the audience of Jorja Fleezanis, whose late husband Michael Steinberg had set the bar for Encounters excellence for so many years. In his honor, the series has been named in perpetuity the Michael Steinberg Encounters Series. Ara rose to the occasion and left us all informed and inspired. 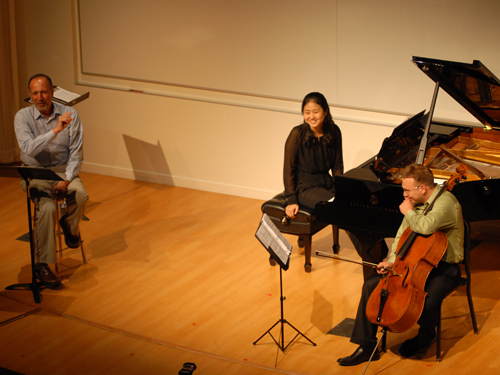 The Encounter was enhanced by performances from CMI faculty members Dmitri Atapine and Hyeyeon Park, as well as by the Miro Quartet. It was a personal pleasure to participate in two works on the Vienna program: one, an early Haydn Concertino for piano (with Wu Han, Jorja Fleezanis and Erin Keefe) and also the Brahms G major sextet (with Erin, Jorja, Lily Francis, John Largess and Ralph Kirshbaum). Also included was a powerful, polished rendition of Arnold Schoenberg’s Chamber Symphony, arranged by Webern for small ensemble. Making their festival debuts were clarinetist Todd Palmer and flutist Tara Helen O’Connor. 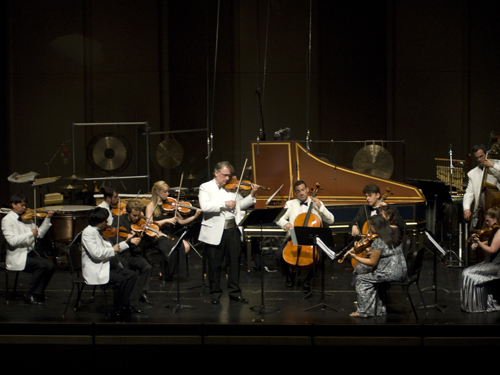 The Aftermath concert, from the perspective of our audience, was one of the most challenging programs in the festival’s history. We were immensely gratified to see the turnout of so many who were clearly told – as a result of our truth-in-marketing practices – that this program would have more than its measure of sadness. 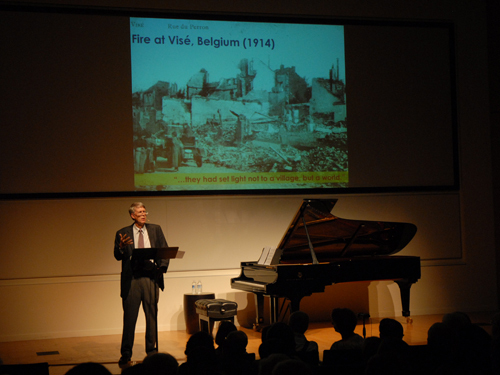 All of the works were composed as a reaction to the devastation of World War II; the program concept was a natural fit with the festival’s exploration of music from times and places. And the music itself – Shostakovich’s 8th Quartet, Britten’s The Holy Sonnets of John Donne, and Strauss’s Metamorphosen – reminded us all of the power of the chamber music medium to express the deepest, most serious emotions in a powerfully intimate way. 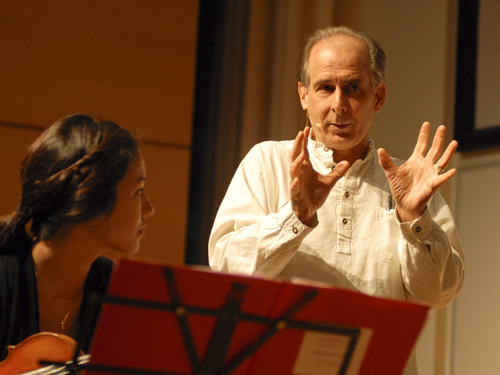 Composer Bruce Adolphe arrived to deliver the Encounter prefacing our program exploring La Ville-Lumière, illustrating the wide range of musical styles present in Paris during the 1920’s. Moving from the quintessential French composers to the mavericks such as Antheil, and the foreigners such as Copland and Prokofiev, Bruce worked his usual magic with the audience, providing us with key information and musical examples while keeping everyone on their toes with his lightning wit and keen audience awareness. 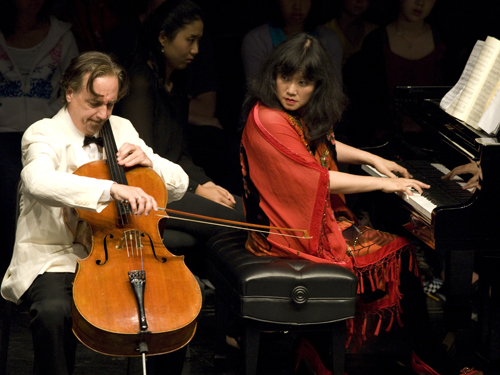 In the middle of all of this, Wu Han and I (somehow) managed to play all the Beethoven sonatas (we had previously performed them in Aspen) in front of a stage-seats-added house in our new venue, the Menlo-Atherton Performing Arts Center. This was not an easy task in the middle of running the festival, but we started and ended (I’m not sure what happened in the middle) in one piece, and everyone seemed happy. The Paris program was, perhaps, the most diverse of the entire festival, not counting the Vivaldi/Crumb pairing of the opening night. 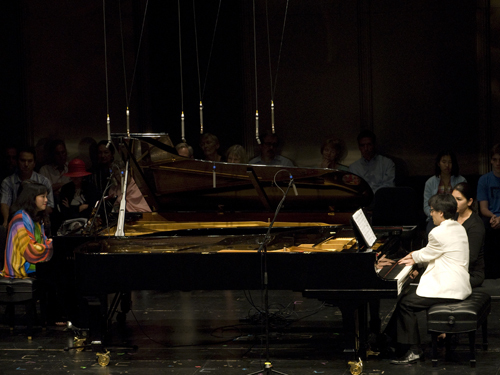 Only a couple of the pieces were actually by French composers, which somewhat took the audience aback, but by the time Wu Han and Ken Noda took the stage for the two-piano version of Gershwin’s An American in Paris, our listeners had come to realize what a hugely diverse musical environment Paris was in the Roaring Twenties. The next Carte Blanche Concert was a performance which will live long in the memories of all who heard it: Alessio Bax’s three-segment solo recital in Stent Family Hall. Asked to contribute a program, Alessio sent us one based upon his recent Bach transcriptions recording, but then, eyeing the festival’s theme, offered us not only an additional Spanish program, but also an Italian recital (Italy was missing from our programming!). The concert lasted from 10am to 2pm with a short lunch break, and the consensus among the pianists, including Wu Han, was that none of them could remember hearing a better piano recital, ever. That may sound like an exaggeration but you had to be there to believe it. I still cannot quite believe it. Alessio played some of the most difficult music ever composed for piano with consummate virtuosity, always in perfect control yet taking risks, seemingly missing nothing, all with beautiful sound, combing delicacy and thunder, elegance, poise, flawless memory and tasteful showmanship. 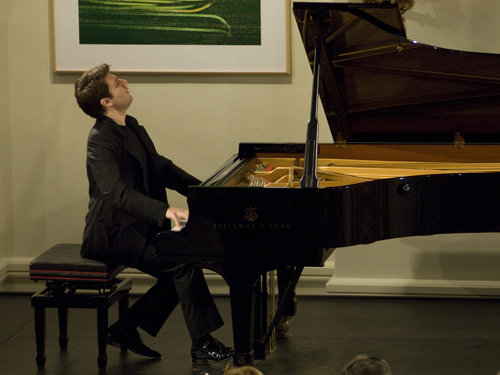 We are immensely proud to have brought Alessio to Music@Menlo and to The Chamber Music Society; in our opinion, he is among the greatest pianists on stage today. I’m sure that our Menlo audience that day would have to agree. The Spanish Inspirations program, curiously, contained more music by French composers than the Paris program. We were keen to show the powerful influence that Spanish music had on Debussy and Ravel, hence the inclusion of the former’s string quartet and the latter’s piano trio. Surrounding these works were mesmerizing solo Spanish guitar pieces, performed by Jason Vieaux, including Falla’s Spanish Songs with mezzo-soprano Sasha Cooke. The Spanish influence – including many guitar-like effects for the quartet using pizzicato – was obvious when the works were neighbors on the program, illustrated as well by the haunting Basque rhythms employed by Ravel in his piano trio. The Jupiter Quartet made their quartet debut in the Debussy, and returning artists Arnaud Sussmann and Laurence Lesser joined Alessio Bax (only a day after his marathon recital) for the Ravel. Squeezed in between lunch and afternoon coachings was a cello ensemble session which included celllists from the International Program, the Young Performers Program, and senior artists. 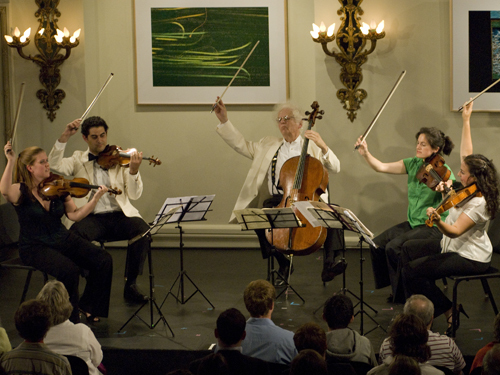 We read through Bach cello quartet transcriptions by the Finckel family (available at http://www.finckel4cellos.com) and also my father’s spicy Flamenco Fantasy, to the amazement of many listeners who had never seen or heard so many cellos together. Later the same day, our Institute faculty gave a concert of works by Kirchner and Taneyev, to the amazement of us all. Teaching all day, every day, they had somehow found the time and energy to keep in shape and rehearse, and they delivered performances of the highest level that we would have been proud to present on any stage. It was a great opportunity for their students to hear them practice what they had been preaching, and we all left with newfound amazement and respect for these marvelous, dedicated artists who were such an asset to the festival. After an absence of several seasons, the brilliant educator Robert Winter returned to lead the final Encounter on Dvořák’s America. Well-versed in this material (he created the first classical music-educational-interactive CD-ROM on this subject in the 1990’s) he provided the audience with facts and context surrounding not only on Dvořák’s famous visit to America in the 1890’s, but detailing the history of America’s music and its evolution, influenced and informed by immigrants, Native Americans, and African Americans. 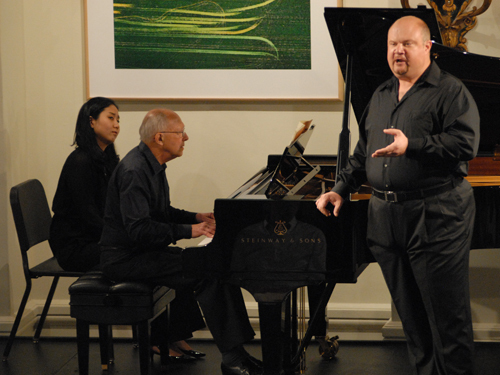 It was the perfect prelude to the festival’s final program. 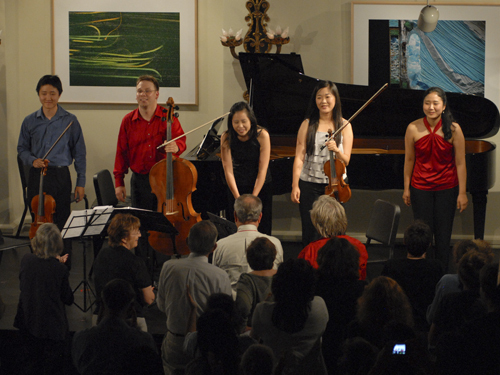 While someday there will likely be an all-American program at the festival, we found it interesting this year – especially in light of the cross-cultural French and Spanish programs – to look at and listen to America through the eyes and ears of Dvořák, who was brought to New York in 1893 not only to head the National Conservatory but to help America discover its own musical voice. His well-documented fascination with the music of African Americans, his friendship with Harry Burleigh, and his trips to Spillville, Iowa, all came to the fore in this concert which featured both works composed by him in Spillville, the “American” string quartet and quintet. Accompanying these great works (that draw on spiritual and folk tunes) were songs by Burleigh, sung gorgeously (again!) by Sasha Cooke, who also took us on a fast-forward of the genre with songs by Samuel Barber and William Bolcom. It all fit together beautifully and the festival closed, as Wu Han predicted, with a smile on everyone’s face. 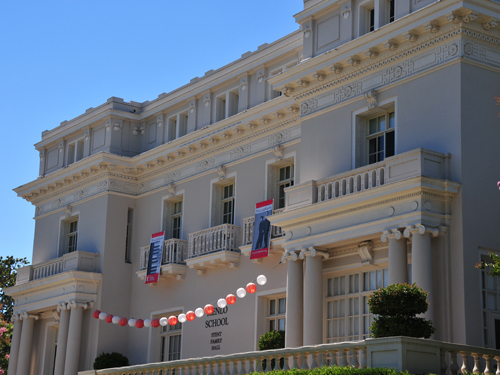 I have touched upon the festival’s major events in this post; they are, however, among myriad public offerings that make Music@Menlo an unforgettable experience. 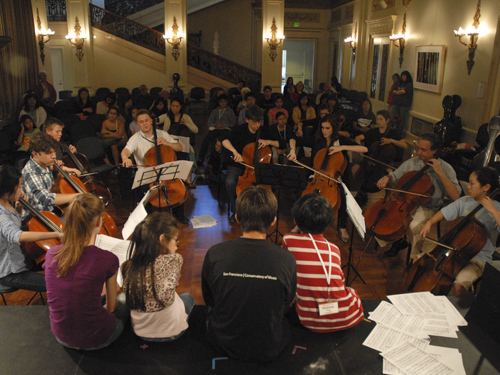 The festival’s opportunities for learning and engagement run practically non-stop, from open coachings and rehearsals at beginning daily at 9:15am, to the daily master classes and Café Conversations (free and open to the public) to the newly-established post-lunch half hour exploratory session (so young it’s not yet named) to the afternoon rehearsals, frequent KYPC concerts (Koret Young Performers Concerts), to Patrick Castillo’s new Listening Room sessions, to Prelude Performances and finally the evening concerts. I would like to take this opportunity to acknowledge the many extraordinary people who make Music@Menlo possible: our brilliant, generous, devoted, engaged and hard-working board; Music@Menlo’s staff, year-round and seasonal, led by Executive Director Edward Sweeney; the ArtistLed staff which provides the festival’s artistic administration; our devoted volunteers and home hosts; the extraordinary artists who come on good faith the first time and return eagerly thereafter, and who give so much more of themselves than just performing; and our famous public, the Silicon Valley audience that was not supposed to be interested in classical music, but which now helps Music@Menlo set a shining example for the rest of the world to see and envy.